Biologist Cindy Van Dover routinely finds new, unusual creatures when she dives to unexplored areas of the ocean in the deep-sea submersible Alvin. 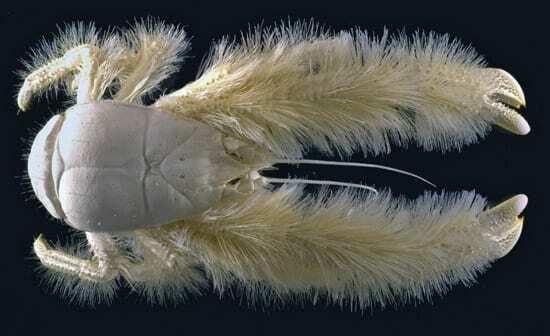 So she was not particularly fazed when she and biologist Michel Segonzac spotted the white crab with long, hairy arms on the seafloor in the southeast Pacific in March 2005. Months later, though, Van Dover became excited after Segonzac examined the crab’s morphology and found that it was not only a new species, but that it belonged to a previously unknown genus and—even higher in the hierarchy of taxonomy—to an entirely new family of crab. “Now I think it is a superb creature and very curious,” said Van Dover, a scientist at The College of William & Mary. She’s not alone. 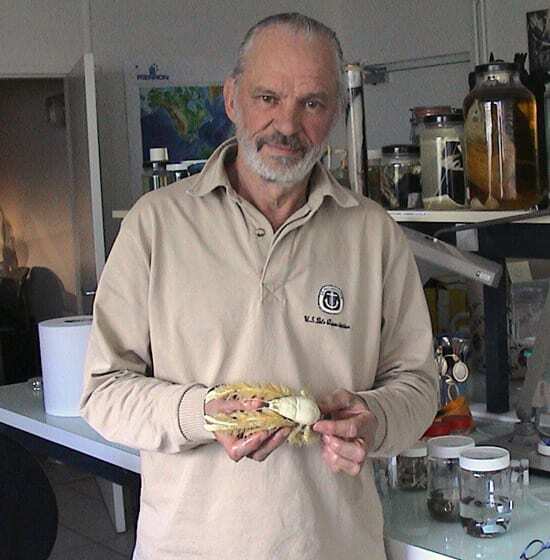 Segonzac and colleagues published their findings late last year in the French journal Zoosystema, and this spring the crab’s image began appearing in magazines and newspapers worldwide, from Popular Mechanics to The New York Times. The name of the new family, Kiwaidae, comes from Kiwa, a Polynesian goddess of crustaceans. It’s only the second new family of deep-sea crab identified since the mid-1800s. 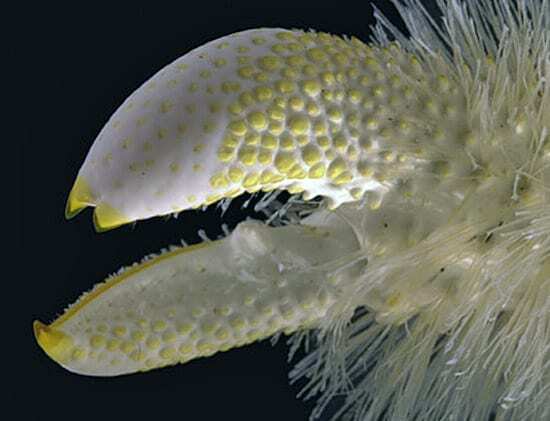 The crab’s genus and species is Kiwa hirsuta (the latter from the Latin word for “shaggy” or “bristly”), which scientists picked after seeing the crab’s long arms, coated with yellow-tinted white hairs that feel like toothbrush bristles. Less formally, the new-found creature has become known as the “Yeti” crab, after the legendary shaggy “snowman” of the Himalayas. An image of the crab, displayed at a science conference in Scotland, “sent murmurs up around the room,” Jones said. One online blog by non-scientists called the crab “sublime and magical and perfect in its alien weirdness.” Another blogger posted contemporary rap music dedicated to the crab. A woman in Tokyo sent Jones a sewing pattern for crafting stuffed animal versions of the crab. The pattern, she said, has been downloaded from her web site more than 2,300 times. Though the crab has been compared to a lobster, Jones said it is actually a distant relative of the hermit crab. 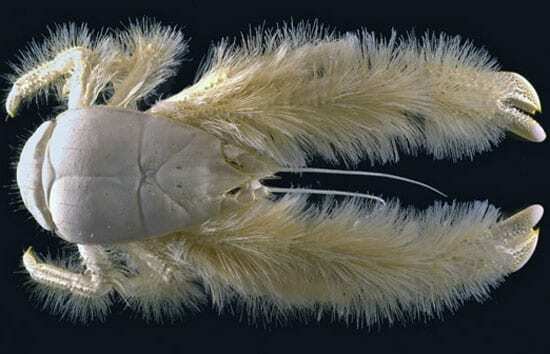 Scientists are beginning to study the bacteria living on the crab’s hair; video footage taken during the Alvin dives shows the crabs holding their hairy claws over plumes of hot, mineral-rich fluid flowing from seafloor cracks called hydrothermal vents. How the crab uses the bacteria remains a mystery. Researchers speculate that the crabs may house bacteria in their bristles, where the bacteria reproduce and provide a steady source of crab food. The bacteria may also serve to detoxify poisonous compounds, such as sulfur, emitted in the vent fluids. Or the bacteria may convert sulfide compounds into food in exchange for a place to live on the crab. “We will need additional specimens of crab to establish the relationship,” Jones said. The crab was an unexpected find during an expedition, led by MBARI scientist Bob Vrijenhoek, to learn how seafloor-dwelling animals from one hydrothermal vent colonize other vents hundreds or thousands of miles away. On an Alvin dive, Segonzac, from Institut Français de Recherche pour l’Exploitation de la Mer (IFREMER) in France, noticed unusually large crabs lurking among seafloor rocks. The researchers saw more crabs during subsequent Alvin dives. Most were living at depths of about 7,200 feet (2,200 meters) on areas covered with fresh lava, or areas where warm water was seeping from the seafloor. The study site was about 1,000 miles south of Easter Island. It was Alvin’s first trip that far south in the Pacific in its 40-year career, said Rick Chandler, a submersible operations coordinator with the Alvin group at WHOI—which might help explain why Kiwa hirsuta has never been spotted before. Future expeditions will explore the crab’s range in the South Pacific, Jones said, and scientists hope to collect several more samples to examine differences between males and females. And the fate of the famous first crab they captured? It’s stored in a sample jar at the French National History Museum in Paris, part of its large reference collection of deep-sea crabs.